My Monarch Guide: Monarch Butterfly Milkweed Mania! : Is it possible to gender ID a pupa? Is it possible to gender ID a pupa? One of the cool things about the Monarch is that you can identify whether the butterfly will be a male or female when it is still a pupa! That's right–while the butterfly is undergoing metamorphosis, if your eyesight is keen, then you can determine whether or not you will end up with a male or female Monarch butterfly! Here's how to identify the gender of a Monarch from the pupa. What you want to do is to look right below the cremaster. 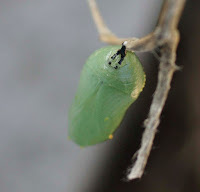 The cremaster is that little black thing that hangs/connects the chrysalis to something (whatever the caterpillar decided to pupate on). Below the cremaster you will spot some little black dots. Around the whole thing are all these concentric circles going around the chrysalis. Look carefully and you will see the black dots in two rows that are vertically aligned. Okay, now look at the concentric circle indentation BELOW (under) the black dots. 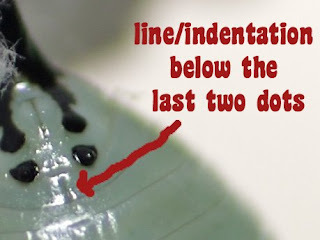 IF you find a vertical indented line of sorts (see the picture with the red markings) then the butterfly that will eclose from that chrysalis will be female. If you find that there is NO indentation (see the picture with the white markings) then the butterfly that will eclose will be a male. So, again: line=female, no line=male. Note: Click on the pictures for a close-up view. Wasn't that easy? Amazing, isn't it? Now, go and astound your friends and family!